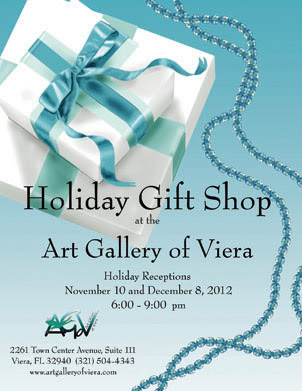 Art Gallery of Viera announces our Holiday Gift Shop which will run from November 9, 2012 through January 5, 2013. To apply, artists will need to email a few representative jpegs of their items to call4art@artalleryofviera no later that midnight October 31, 2012. For more information, go to www.artgalleryofviera.com and the Holiday Gift Shop Call For Art. The gallery is located in the Avenue at 2261 Town Center Avenue, Suite 111, Viera. (321) 504-4343.